...the Queensland event and party hire specialist. Licensed to thrill! This attraction doubles as a dual bungee and dodge ball challenge. No waiting as the dodge ball contestants are competing, the bungee contestants can be fitting their harnesses. Brand new and a very big through-put attraction. 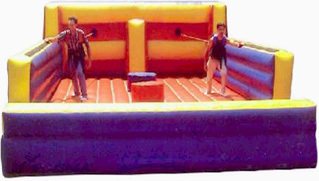 Ideal for schools, clubs, churches and parties. Just wanted to say a Big \"Thank You\" for the mechanical Bull hire on Saturday night. Bruce was fantastic with the children and adults at the party, everybody had a great time and commented on how Bruce ran the night. We hope to use use your services again in the future. It’s been a pleasure dealing with you over the years. I am sure the girls will find the same in the future. Thanks for looking after us at our staff party. The cash box was a big hit! ","Youth Council\'s Big Day In",""] slideshowcontent1=["
","Youth Council\'s Big Day In", "",""] //slideshowcontent1=["
Thank you and your crew for being a part of our junior breakup. You guys arrived on time and were professional in your management of the rides which greatly contributes to the success of the day. Just wanted to drop you a quick line to say a big thank you to both yourself and Mick for your help over the weekend. It was a great success and Mick did a fantastic job. I believe that you will need to invoice us for an additional hour that we kept Mick onsite for the Friday night? Thanks again and I appreciate all your help :) I will be sure to keep Active Attractions in the front of my mind for our future events. Just wanted to thank you for a great day on Saturday. Also I wanted to mention what a great bunch of guys you have working for you, they were great with the kids, kind and friendly. Everything went smoothly and everyone commented on what a great set it was. Once again, thank you and I'll be in touch next year when I get a date and budget. Thanks for your email. The launch went very well, we were extremely happy with your guys and equipment – The rides looked great and all your staff were very friendly and helpful. We have already had a lot of positive feedback! I hired a mechanical bull for my 40th on Sat 12th Jan, just want to say a big thank you was heaps of fun. Everyone loved it an the man that came was really good turned up on time an was very professional what a great company to deal with once again thanks. Thank you so much for all your help with our event last weekend. It all went really well and the rides were a big hit. It was a relief to see the staff there too. I just wanted to write and say thank you for Saturday. Your guys were brilliant. They were not only professional but friendly and a pleasure to have at the grounds and around our children. Once again your company has been outstanding, arriving well before time and I didn't have to worry about anything, they took care of it all and made sure the day for the kids was brilliant. They even brought up the lost property and cleaned up the rubbish around the rides, just unheard of but makes all the difference. Please pass on our thanks and gratitude to your team, we will definitely be in contact early next year to secure our booking for the 4th year in a row since I have been Events Co-ordinator for our club. We are considering a few water rides etc. for next year, so I look forward to seeing what you have. I just wanted to thank you for the amazing job that your staff did over the weekend at the Good News Book Fair. From the moment they arrived on sight, they were professional, enthusiastic and eager to provide the best experience for everyone on the day. Diego did a great job setting up everything for both your attractions as well as being considerate of the other companies on the day... and having him as an extra person to oversee the three rides made a big difference. Thank you for your professionalism through the entire booking process through till a very successful day. We look forward to booking with you again next year. thank you so much for ideal connection allowing us hire you attractions. your staff where brilliant. I will be using your company on further event. But unfortunately the day wasn't a big success it was quiet for us. but all the boys where brilliant to talk with threw the day even thou day was quiet warm. the future event id happy to have those all boys again if they are available. I hand the gentlemen sorry I cant not remember his name. wasn't tim it was the one running it. I gave him a certificate to say thank you for participating in our family fun day.